We would like to inform you via this news update on the DVTK initiative. As a community we are planning to make further steps regarding the DVTk open source DICOM tool set at www.dvtk.org this year. We are happy to announce an upcoming release of the DVTk tools that will support new VRs (OD, UR; Other Double, Universal Resource Identifier or Universal Resource Locator (URI/URL)). This release will be based on the .NET 4.0. This means it will eliminate the need to install older (2.x) .NET frameworks when installing DVTk tools. We are currently testing and planning to make the release available at the beginning of May 2017. Are you bothered by the old application icon of DVTk? Well in that case, now is your chance; we would like to challenge you to design and submit your new DVTk application icon! Please do so before May 5th. The winning application icon (picked by a jury of DICOM experts to avoid a Boaty mcBoatface) will be included in the upcoming DVTk tool set release. The winning application icon will be announced on May 12th, at the DVTk website. 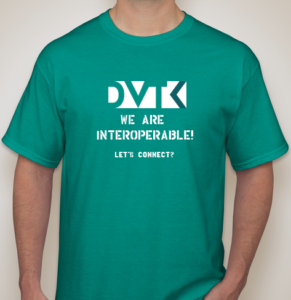 Besides eternal fame & honorable mentions at our DVTk community website, the winner will receive a one-of-a-kind unique DVTk t-shirt! • Provide your application icon (set) by submitting it as an attachment to the ‘Application icon contest’ topic at the forum of the DVTk website before May 5th. • Make sure you have a .ico format icon file, with at least a 32x32 resolution icon. Additional higher resolution icons are welcome of course. If you have further questions on the contest; feel free to submit those in the ‘application icon contest’ topic at the forum. We’re playing with the idea to start a crowdfunding campaign on updating the definition files set provided along with the DVTk tools. The definition file set has not been updated for quite a while and the DICOM standard has evolved. To update all definition files that DVTk uses to the latest version of the standard takes considerable effort. If you are inspired and interested, let us know what you think in the respective discussion topic of the DVTk forum at the website.